SuperFrog appeared in several Nokia commercials nationwide along side Snoop Dogg and Johnnie Cochran during the Sugar Bowl and other Bowl Championship Series games. A frog meeting a queen might sound like a fairy tale, but its one that Jeff Crane will get to share for the rest of his life. SuperFrog, played by Jeff Crane, assistant marketing director for athletics, was in a series of interactive Nokia commercials directed by filmmaker Guy Ritchie. Crane got to meet pop queen Madonna, who visited her husband, Ritchie, on the set in Los Angeles with their 3-year-old son, Rocco. 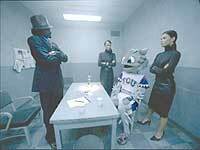 Snoop Dogg interrogrates prime suspect SuperFrog during one of the final Nokia commercials. After a semester of reviewing applications and interviewing candidates, the provost search committee has named a geologist, a chemist and a political scientist as the front-runners for the universitys second-highest position. Greetings from all your friends at the TCU Daily Skiff. College is said to be a time for experimentation and self-discovery, to strike out on ones own  form your own identity and opinions. Head coach Gary Patterson was a finalist for the Eddie Robinson Award, but the honor went to LSU coach Nick Saban.